(CNN) -- The death and injury toll from a stampede at a Cambodian festival continued to rise Tuesday as families mourned. The number of deaths is now at 375 and the number of injured is up to 755, the country's official news agency said Tuesday. Cambodia has declared Thursday a national day of mourning for those who died Monday in the crush at the annual Water Festival in the capital city of Phnom Penh, the news agency AKP reported. On Tuesday some victims' families and leaders gathered for a religious ceremony for the dead. The government said it will help to transport the bodies of those who died and pay 5 million riel ($1,230) to the family of each of the deceased. What caused panic on suspension bridge? The three-day festival, which began Saturday, is held each November near the palace to honor a victory by Cambodian naval forces during the 12th century reign of King Jayavarman VII, according to the country's tourism website. During the festival, which includes boat races, participants pray for a good rice harvest and enough rain, and celebrate the full moon, the site says. 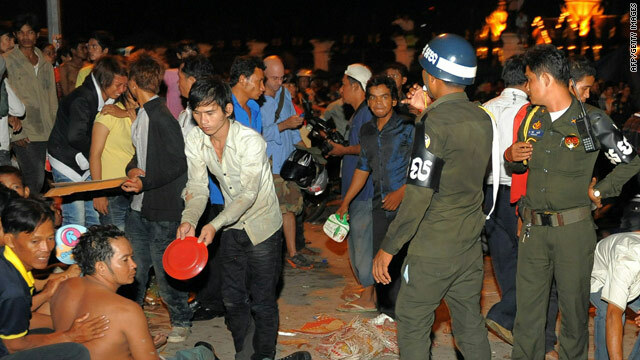 The municipal police chief said the stampede, which began around 10 p.m., likely occurred because a suspension bridge packed with people began to sway, creating panic, said Philip Bader, a news editor with the Phnom Penh Post newspaper. Steve Finch, a journalist with the newspaper, said police began firing water cannons onto a bridge leading to an island in the center of a river in an effort to get them to continue moving across the bridge. "That just caused complete and utter panic," he told CNN in a telephone interview. A number of people lost consciousness and fell into the water, he said. The country has set up a commission to look into the incident.